Welcome to the Schoerke Foundation! We promote excellence and high achievement in education in Ghana, and provide educational opportunity by offering scholarships to students. Since our establishment, nearly 1600 boys and girls have attended school tuition free. The Foundation is wholly reliant upon a community of generous donors who share our commitment to eradicating the cycle of poverty through education. Gifts to the Foundation go directly to student scholarships and to support programming, curriculum, and facilities at our partner school, Heritage Academy, a pre-K through 12th grade school which has campuses in Breman Essiam and Ochiso. We invite you to help support our mission and give the gift of education – a gift that every child deserves! 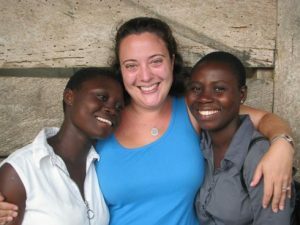 The Schoerke Foundation was founded by Melissa Schoerke Koomson in 2006 to provide scholarships for students in Ghana and grants for students from the United States to study in Ghana for three weeks in the summer. The foundation is named in honor of Melissa’s parents, Andrew and Nancy Schoerke, and her sister Jennie.